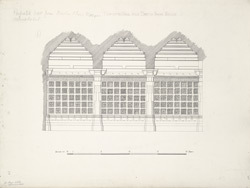 Illustration of a perforated wall from the Mosque of Dastur Khan in Ahmadabad, Gujarat from James Burgess' 'Original Drawings [of] Muhammadan Architecture of Ahmadabad.' Located south of Ahmadabad's Jami Masjid near the Astodiya Gate, the mosque was built in 1486 during the reign of Sultan Muhammad Begada (r.1459-1511) by Dastur Khan, one of the sultan's ministers. Within this mosque complex, the tomb of Dastur Khan is located near the south doorway in an open courtyard. The courtyard walls within the mosque complex are decorated with perforated jail screens as illustrated here.